It seems there has been a bit of pushback to an Associated Press story about a meeting yesterday between leaders of the Louisiana House of Representatives and state Senate president John Alario, standing in for Gov. John Bel Edwards, over budgets and taxes. Alario was the major source of the story, and it was framed from his perspective. Neither House Speaker Taylor Barras nor House Republican Delegation chair Lance Harris were interviewed for the story, written by AP reporter Melinda Deslatte, though she said she put calls in to both. What Alario told Deslatte was that “ideally,” he would be able to hammer out a deal with Barras and Harris before the next special session begins on Monday, and that he thinks it’s important all the legislators get over the angry words which pervaded the end of the past special session. What we’re being told today, somewhat as pushback to a post we had this morning expressing discontent over the specter of a deal with Alario given the treatment Alario’s string-puller, Gov. John Bel Edwards, has afforded House Republicans and by extension their constituents, is that Alario doesn’t speak for the House leadership. So much so that Edwards has been bringing Republican legislators up to his office in small groups attempting to berate them into folding on taxes, to little avail so far. We’re told the leadership attended the meeting with Alario and listened, but that no commitments were made and no parameters of a deal were pushed forward. Alario wanted to talk, so they talked. There is some discussion of a sales tax renewal at 4/10ths of a penny, and at that rate state government would have to be cut. 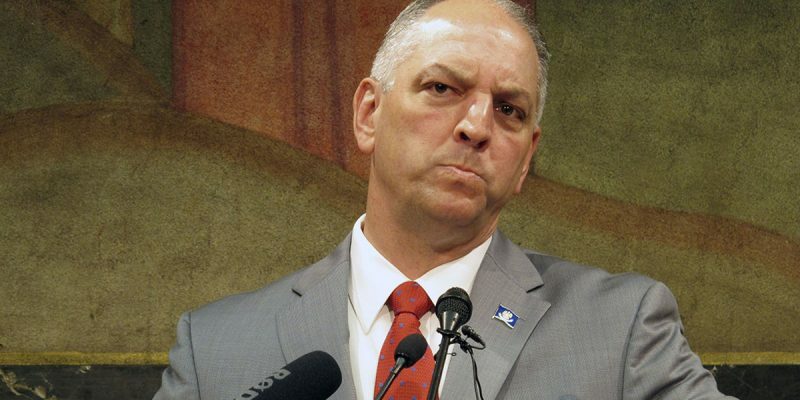 And some cut in state government, even if it’s nominal, must be made or the House will not deliver 70 votes for a tax increase like Edwards wants. That tax increase might be 4/10ths of a penny, or it might be less. And with what happened this afternoon, “less” is starting to look more like the likely possibility according to the leadership. Edwards’ call for the next special session attempted to limit the parameters of what the legislature could do within the state budget. He was specifically trying to protect the Louisiana Department of Health from further scrutiny and potential cuts from the budget he signed last week. But the clerks of both the House and Senate ruled today that the limitation of scope in Edwards’ call is out of order. Specifically, that the governor doesn’t have the power in a legislative call to subject some portions of an object to legislation but bar others – either that object, in this case HB 1, the budget bill he signed last week, is subject to the call or it isn’t. What that means is next week there will be a full-on appropriations process once again. After speaking with staff, we believe we can make adjustments to HB 1 and appropriate any revenue raised through a supplemental bill,” House Appropriations Chairman Cameron Henry told the Hayride this afternoon. This matters, because when LDH coughed up $60 million in supposedly untouchable money on the final day of the last special session and offered it to Senate Finance Chairman Eric Lafleur as a budget cut, lots of ears were perked up in that legislature. For three months during the regular appropriations process LDH steadfastly refused to admit anything could be cut, and when the House was less than impressed with that position and passed a budget out of the Appropriations Committee funding LDH at $11.9 billion – less than the $13.5 billion it’s funded at in the current fiscal year but $2.4 billion more than it received in FY 2015-16 – Edwards rushed eviction notices out to 37,000 senior citizens in nursing homes. There is a real sense in the House – an overwhelming sense, we would say, based on our conversations with several members – that hundreds of millions of dollars are squirreled away within LDH and the other state agencies on purpose, and that the only reason to continue negotiating with Edwards rather than to tell him to pound sand and make do with what he has is a real fear Edwards will maximize the pain on Louisiana’s people, rather than govern responsibly if he does have to cut the budget. It’s the old Washington Monument Strategy, except it could be real and not just a threat. One way to interpret that would be to say Edwards has successfully cast himself in the role of Richard Nixon under the old Madman Theory; that being Edwards is so volatile and irrational he must be appeased because the potential consequences of a conflict with him could be unacceptably cruel. That actually worked to an extent when Nixon and Henry Kissinger played it on the North Vietnamese, but to make it work the madman must be credible and not bluffing. A full appropriations process is how to call this bluff. If Henry is able to bring the state agencies, and particularly LDH, into what they’ll consider to be a kangaroo court or show trial and forcing them to justify expenditures line by line where real cuts are on the table – after months of stonewalling in front of House Appropriations during the regular session – then the madman’s credibility is greatly diminished and his threats lose weight. We’re told that’s what’s coming next week, and the session will be far more about budget cuts than it will be about tax increases. Because if the supplemental budget bill is more about moving money around within the current budget than it is about disbursing funds realized through a tax increase, it’s going to spare the majority in both houses a lot of heartburn. And if that’s not the way Edwards likes it there are very few of them who currently care. We’ve heard a lot of this before. We’re not convinced it’s real. We are convinced that the legislators are hearing from their constituents, though, and what they’re hearing is not a demand for raising taxes. Quite the opposite. Next Article WalletHub ranks Louisiana’s economic performance worst in U.S.